Cockroaches; everyone knows them and most of us hate them. But not all people do! There are many big and beautiful species that are being kept as pets. Most of them are not at all like the species you see infesting a house! On this page you can find information about the morphology, senses, life cycle and natural habitat of a cockroach. On the bottom of the page you will find general tips and quick info about keeping cockroaches. Many cockroaches are not kept as pets but as food for reptiles such as chameleons and geckos. Cockroaches can also be fed to your praying mantis. The information on this page can also be used to keep and breed healhty cockroaches as feeder insects, so your reptile stays healthy too. Cockroaches have the same body plan as other insects: three body segments (head, thorax and abdomen), six legs, two pairs of wings, two antennae and two eyes. Some species have underdeveloped wings that cannot be used for flying. Others having wings of normale length but are still not capable of flying. Cockroaches generally have a head that faces downwards and is covered by their back shield (actually an extension of the thorax reaching over the head). When seeing a cockroach from above the head is not visible for most species. There are around 4500 species of cockroach. Just a few are kept as pets or feeder insects. The most common cockroach species bred as feeder insects are the Dubia cockroach (Blaptica dubia), the Red Runner roach (Blatta lateralis) and the Green Bananna Roach (Panchlora nivea). The most common cockroach species that are kept as pets are the Madagascar Hissing Cockroach (Gromphadorhina portentosa), the Death’s Head Roach (Blaberus craniifer) and the Indian Domino Cockroach (Therea petiveriana). Cockroaches have the same senses as we do: sight, smell, hearing, taste and touch. Their senses are not located in the same organs as in humans! Cockroaches can hear with their feet. They actually sense vibrations with their feet instead of with an ear-like structure. Their sense of smell is located in the antennae. Cockroaches have compound eyes with which they sense light, including ultraviolet light. Cockroaches are part of the hemimetabola insect group; they have an incomplete metamorphosis. Newborn cockroach nymphs look exactly like adult cockroaches, with a few small differences (e.g. the absence of wings). These nymphs shed their skin (molt) every few weeks into a bigger nymphal stage. Newborn nymphs are called L1 nymphs, the next molt L2 and so on until they are adult. Adults can be recognized by their wings; nymphs do not have wings while adults do. Some species never develop wings, also not when adult. The eggs of cockroaches are located in egg-sacks called ootheca. These ootheca are made of a type of foam to protect the eggs. Some species of cockroach drop these ootheca to the ground, others glue them on a chosen spot and yet others keep the ootheca inside their body until the nymphs hatch. Cockroaches occur in all continents (except Antarctica) and almost all countries. This means their habitat is also very diverse; some cockroach species live in humid conditions, dry conditions, hot places, cold places etc. Most species that are kept as pets live in humid environments in the tropics. These cockroaches are usually really big and easy to keep, which contributes to their popularity. On the pages about the specific species of cockroach you can find all about taking care of that species. Here is just some quick info about keeping cockroaches as pets. Your cockroaches need a terrarium or enclosure which is safe, escape proof and big enough. Young cockroach nymphs can escape through the smallest cracks because their body is really flat. Sliding doors commonly used in terraria have an open space between the doors where young cockroaches can escape through. Some cockroach species can walk onto vertical glass or plastic while others can not. Some species can fly. Be sure to check what your species of choice is capable of to provide it with an escape-proof enclosure. The size of the tank depends on how many roaches you want to keep and and on their size. Generally speaking the tank should be at least 6 times bigger than the space the cockroaches occupy. In this way there is enough space for them to walk around and to get away from each other if they want to. Bigger is always better. You need to provide your cockroaches with a good substrate and with hiding places. What is suitable depends on the species of cockroach you keep; some need a moist environment while others need a dry environment. For moist environments you can generally put moist soil at the bottom of the tank. As hiding places you can provide tree bark, flat stones and wood. For dry environments you can cover the floor with oats and you can provide egg cartons or small cardboard structures as hiding places. Adequate temperature and humidity are crucial to the survival of your cockroaches. Be sure to check what your species needs. A too high humidity will cause death, a too low humidity will cause bad molts, wrinkled wings and also death. 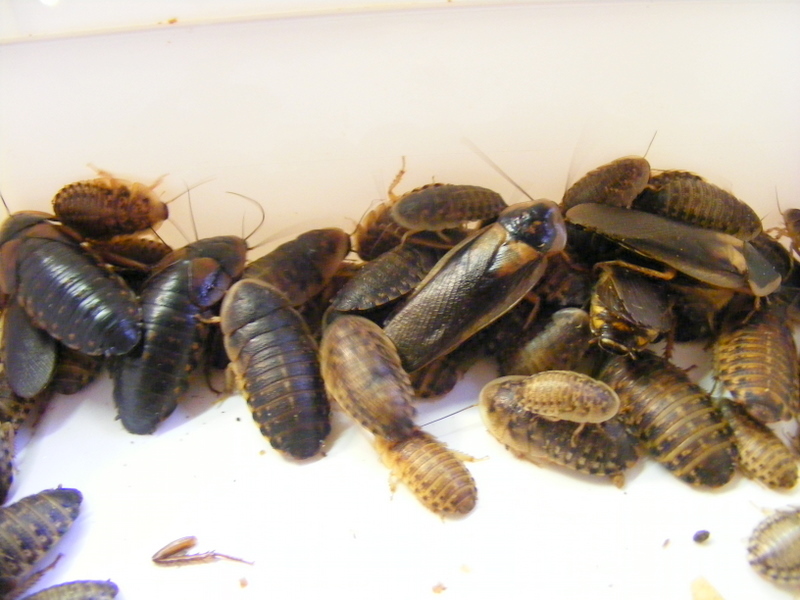 Cockroaches generally eat fruit, vegetables, moistened dry cat food, moistened fish food, rotting wood and rotting leaves. Not all species eat the same. Some species only live of specific food sources such as rotting woods, while others can live off anything. You can feed your cockroaches just by placing the food in their enclosure. If the food goes bad easily, like fruit and vegetables, remove it before it starts to mold or rot.